This OSPAAAL poster from 1978 by Olivio Martinez uses warm sun drenched colours to idolise Che whose capture by the CIA and Bolivian Special Forces in October 1967 is commemorated each year on the Day of the Heroic Guerilla. Che was killed a day later on 9th October 1967. 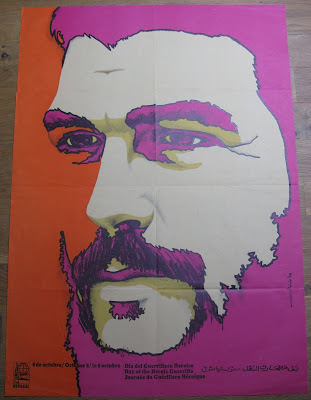 The simple design shows a sombre Che deep in thought and gazing into the distance - a more mature image than some of the more playful Cuban posters which tend to reference pop and psychedelic art. Its a Perfect art. I believe the one who had did this is really a talented Person. I appreciate his work. I too get colorful Posters for my Business advertisement, I use to get it designed from PosterNinjas. They had done an excellent job.